The Chitlapakkam lake is a 40-acre cry for help due to encroachments, and dumping of large quantities of garbage even by the town panchayat, claim activists who audited the water body on Sunday. 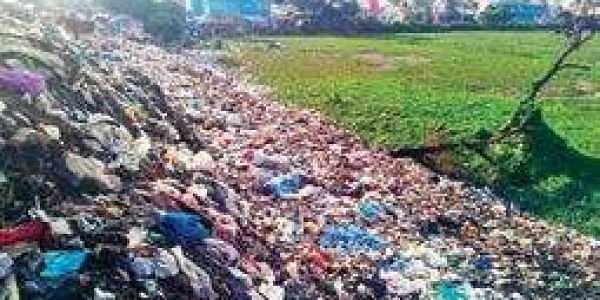 CHENNAI: The Chitlapakkam lake is a 40-acre cry for help due to encroachments, and dumping of large quantities of garbage even by the town panchayat, claim activists who audited the water body on Sunday. Thanks to illegal structures and garbage, the lake which was once spread over 83 acres, has shrunk to half its original size. “The town panchayat authorities tell us that they are looking at other options to dump the waste, which is collected by a private agency after levying charges of around `30 per house, but no action has been taken yet. It’s time they seek scientific solutions to handle the waste,” says Sunil Jayaram, member of Chitlapakkam Rising, an NGO that fights to reclaim the lake and also for other local civic issues. The freshwater lake is now filled with sewage. There is every possibility of the Sembakkam lake also getting contaminated as surplus water from Chitlapakkam lake flows into it. “The lake is filled with water, but it is just sewage let out from houses in the neighbourhood and also from Tambaram,” says Harris Sulthan, State body member from Arappor Iyakkam, organisers of the audit. He adds that there is only one outlet for the lake presently, the width of which is consistently shrinking due to encroachments. In response to an RTI query filed by representatives from Chitlapakkam Rising, the town panchayat had claimed that the water is treated before being let into the lake. However, residents are not convinced. “Construction of a bio-pit system at an estimated cost of `15 lakh was taken up, but not only is the pace of construction slow, the four pits will prove to be ineffective,” said Sunil. With a government school in close proximity to the lake, the construction of the pits, as part of sewage treatment system, poses an additional risk of children accidentally falling into the pits. They are already exposed to health hazards due to garbage and sewage, fear residents. According to Harris, locals had said that at least six cows grazing in the neighbourhood had fallen into the pits and died. The level of groundwater in the area and its quality has also taken a hit due to poor maintenance of the lake, said residents. “The groundwater levels have fallen to such an extent that sometimes even after erecting a borewell for over 300 feet, we don’t get water,” said Kannan.